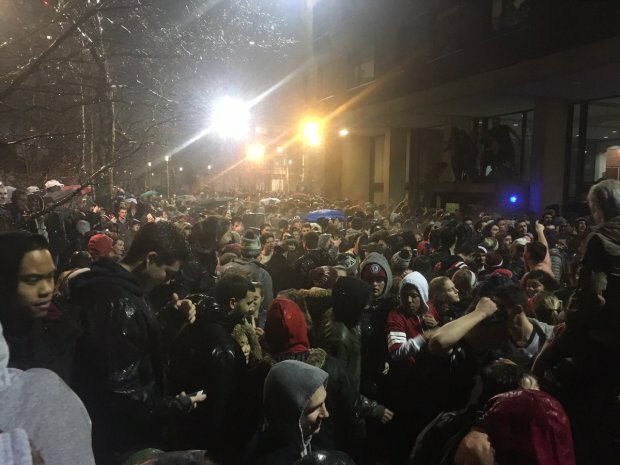 University of Massachusetts Amherst students took to the streets after the New England Patriots' disappointing Super Bowl loss on Sunday night, climbing trees and poles and throwing beer cans, firecrackers, glass bottles and more. Six people were arrested and a number of injuries reported as approximately 2,000 people congregated in the Southwest Residential Area of campus, according to school officials. 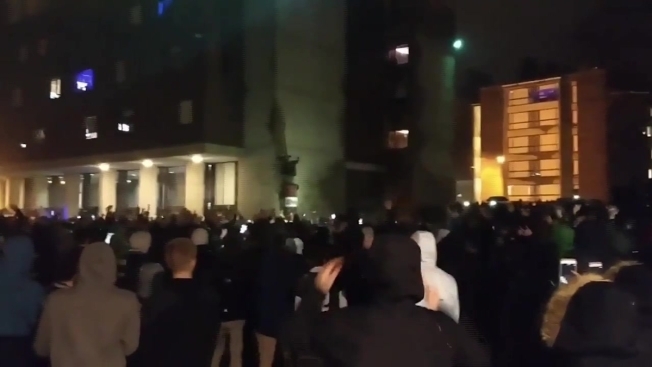 Video shared by student journalists at the Massachusetts Daily Collegian showed large gatherings of people, and police subduing and arresting several subjects. Police were also seen in riot gear as they attempted to get the crowds to disperse. The school said people gathered on the Southwest plaza shortly after the game ended at 10:17 p.m. Amherst Fire Department ambulances transported 12 people for head injuries, lacerations and alcohol intoxication. UMass Police said fights broke out shortly after the game ended, and the crowd threw objects and set off smoke bombs and firecrackers. Police issued orders for the crowd to disperse before using pepper spray projectiles to clear the disturbance. The area was cleared by 11:30 p.m.
Massachusetts State Police and Amherst Police assisted UMass Police at the scene. UMass Police said they are proceeding with criminal charges and the university said it will initiate a "prompt review" of the matter under its student conduct process.